Linda Wisniewski is an award-winning journalist and a writing teacher whose work has appeared in numerous publications both in print and online. Her first book-length publication, a memoir, Off Kilter: A Woman’s Journey to Peace with Scoliosis, Her Mother and Her Polish Heritage” has been praised as “energetic, thoughtful, courageous”, “beautifully written” and “a heart-felt journey from despair to empowerment and hope”. Linda’s and my paths have crossed at various writers’ functions, always to my pleasure, due in large part to her down-to-earth, sometimes irreverent, sense of humor. I was delighted when she agreed to answer some questions about her writing life for the readers of BIRTH OF A NOVEL. LINDA WISNIEWSKI: In elementary school, I won a loaf of Monks Bread in an essay contest about: bread! (It was quite cliche. The first sentence was “Bread is the staff of life.”) All my life, I’ve kept a diary or journal, but I was over forty before I thought seriously about becoming a writer. I was asked to write articles for a pharma trade journal. Soon after, I discovered Writing from Life, a book by Susan Albert, that inspired me to try life writing. WISNIEWSKI: Since I’m naturally interested in people, it’s tough to go into that study, close the door, and be alone with my computer or pad and pencil. Getting past the laundry room, Facebook, and email, and actually sitting down to write is by far the most difficult aspect of being a writer for me. CODY. 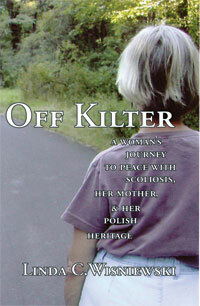 Tell us something about Off Kilter and how you came to write it. WISNIEWSKI: The book began with an essay, “My Body My Self” which was published in Mindprints literary magazine and nominated for a Pushcart Prize in 2003. One of my teachers suggested I expand it into a book. That was so daunting a task, I laid it aside and continued writing and publishing short memoir pieces. Three years later, I found I could tie them together using my scoliosis, or spinal curvature, as a metaphor for my life with its twists and turns and frequent adjustment to relieve pain. CODY: In your memoir, though your affection for your family comes through, you don’t shy away from the parts of family life that we sometimes gloss over. How has your family reacted to the book? WISNIEWSKI. As you might expect, not with total pleasure, but the unpleasant parts are what made me who I am today. I believe strongly in sharing what we overcome, so others with similar backgrounds don’t feel so alone. It appears that my family is passing around one copy, so it’s taking them awhile to react. However, the few who have commented say it is either a) too depressing or b) divulges too many secrets or c) very good. The cousin who picked c is my favorite. CODY. You begin Off Kilter with a quote from Eudora Welty. Why did you choose that particular quote? I love this because she says exactly what happened when I decided to put my essays into a book. They came together by that “thread of revelation” connecting them: my scoliosis and my off kilter life. Though this quote begins chapter one, and the chapters are roughly chronological, I weaved back and forth through time to illustrate the adjustments I’ve made, thus putting them into my own kind of order. CODY: What other writers do you admire? 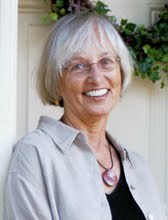 WISNIEWSKI: Carol Shields, the Canadian short story writer, for her clarity. Every word is necessary. Suzanne Strempek Shea, a Polish American writer whose work brings me back to my origins, and whose sense of humor is a delight. CODY: You also teach writing. Does teaching makes you a better writer? WISNIEWSKI: I don’t know…It definitely makes me a better teacher. Almost every class results in me revising what I present to the next one. WISNIEWSKI: Currently, I’m working on my first novel. My family tree has been traced back to a woman born in 1778 in what was then the Austrian Empire. I’m drawn to her story, what little I know of it, and I’ll be traveling to the area where she lived, near Krakow in what is now Poland, in June of this year. And next month, I’ll be presenting a workshop on “Writing Our Cultural Traditions” at Stories From the Heart, a conference of the Story Circle Network, in Austin, Texas. CODY: How do you refresh yourself creatively? WISNIEWSKI: Good question! Something we writers forget to do, I suspect! Walking outdoors, yoga practice, meditation, and reading lots of very good literature. I also belong to two wonderful organizations, the Story Circle Network, http://www.storycircle.org and the International Womens Writing Guild, http://www.iwwg.org/. Attending their conferences every year has introduced me to great teachers and mentors, new writing friends and fresh techniques to sharpen my skills.